You probably know by now that I am always on the lookout for the best skin care products available, and with 2015 coming to a close, I wanted to share some of my favorites that I think you'll love with the new year coming. With so many options available in women's skin care it can be hard figuring out what you really should be using and what's really not necessary. I'm here to help take some of the guesswork out of choosing the products for your beauty routine. So without further ado, here are the must have skin care products of 2016. You should be using a gentle facial cleanser in the morning and evening to clean your skin and remove dirt and other impurities. Choose one that is made for your skin type, whether it's oily, dry or normal. It may take a bit of trial and error to find the perfect one for you. The classic Dove face bar is gentle on your skin and very moisturizing. I really like foaming facial cleansers the best. Neutrogena Fresh Foaming Cleanser and Olay Foaming Face Wash are two of the best skin care products that I have used. If your skin is dull and dry, then try a facial scrub like St. Ives Fresh Skin Invigorating Apricot Scrub to brighten up your complexion and remove dead skin cells. A good toner is an essential in women's skin care. It can help to tighten your pores, make your face feel so smooth and even soothe and calm irritated skin. Burt's Bee's Rosewater Toner feels amazing on your skin and it also smells good. I keep mine in the refrigerator and the cooling sensation is a great pick me up in the morning! Neutrogena Alcohol Free Toner is a great choice for sensitive or dry skin. It does the job without drying or irritating your skin. One of the best skin care products and the most important is a moisturizer that hydrates your skin without feeling oily or greasy. With all of the fancy, expensive products in women's skin care, keep in mind that one of the basics - a moisturizer - is one of the most important skin care products that you need in your beauty arsenal. Moisturized skin looks healthier and younger. If you haven't found "the one", try St. Ives Timeless Skin Collagen Elastin Facial Moisturizer or Olay Total Effects 7-in-1 Anti-Aging UV Moisturizer SPF 15 . Some of us need a bit of extra attention for our problem areas such as fine lines, acne and wrinkles. This is the part of women's skin care that can really be confusing. With so many choices, it can be difficult to choose the best skin care products without becoming a little bit frazzled. My advice is to find something that simply does what you need it to do. Forget all the bells and whistles and find something that works. If you have more than one problem area you may be able to find one product that multi tasks to simplify your beauty routine. Murad Acne and Wrinkle Reducer pulls double duty, which means it does twice the work in half the time while targeting two of the most common skin care issues. 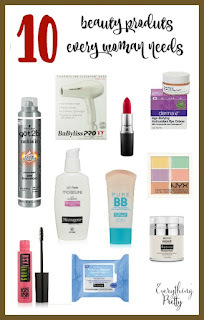 These are some of the beauty products that I have found in 2015. They cover the basic products that we all should be using to care for our skin. I love the fresh, healthy glow that my skin has when I take good care of it but I don't want to spend hours every day on my skin care routine. These products give me everything I need but they don't require hours of my time. What are the best skin care products that you have found this year? Please share them with me in the comments below!